This entry was posted on November 18, 2014 by Luke. NEW IN THE SHOP: An alternative rear rack option for Brompton folding bicycles made by Nitto Japan. Specializing in original designs ranging from handlebars to stems and seat posts, Nitto is known best for their hand-made, fillet-brazed tubular chromoly steel bike racks. Nitto racks are nickel-plated for extra durability with a lovely silver satin finish. The Nitto BM-R3 for Brompton folding bikes is no exception. The BM-R3 is a lovely rack to look at, and we know it will hold up to years of use. -For the fender-less Brompton (E version) the included hardware will mount up the rack perfectly. -For the Brompton with fenders and no rear rack (L version) you can mount the rack with the optional bolt and washer kit (keeping your existing fender). -If you are getting the Nitto Rack to replace your existing Brompton rack (R version) the included hardware is perfect and you will be able keep the R version fender. One of the big benefits of a rack on a Brompton is that the folded bike sits on 4 points instead of 3, making for a much more stable and smoother rolling package. While the Nitto rack comes with casters, adding Brompton Eazy Wheels make it possible to effortlessly roll the folded bike. This is as true for the Nitto rack as it is for the Brompton rack. The Eazy Wheel kit for the Brompton rack are not the same as what you'll need to mount Eazy Wheels to the Nitto rack for Brompton. To simplify things, we have put together the kits necessary to add Eazy Wheels to a Nitto Rack no matter your current set up. See them HERE. The Brompton Rack Sack works nicely with the Nitto rack, though other racktop bags will also work well. A shop favorite is the Arkel Tailrider, as the velcro mounting straps are quick and secure and the bag is loaded with nice features. The Banjo Brothers Rack Top Bag also fits nicely. Keep in mind that when you have a racktop bag attached to the rack, you will not be able to flip the rear wheel under the the bike to put the bike in kickstand-mode. Nitto has not produced a bracket for a reflector or light. 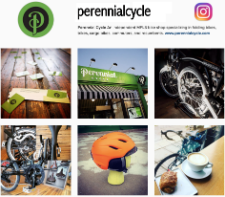 The bracket that we sell as an optional add-on is produced here in Minneapolis for Perennial Cycle. This bracket is not sold as a separate item, but is an option when buying the rack. 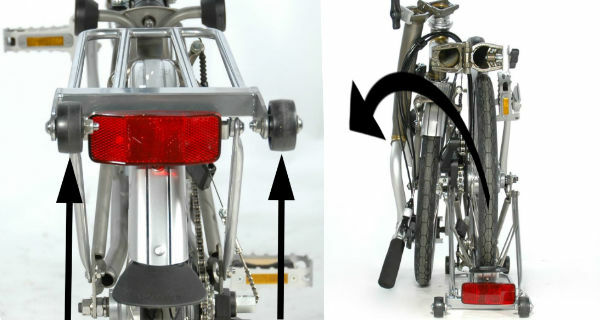 It will work with the Brompton reflector, battery light or a dynamo light. We like using the Highland Fat (and flat) adjustable bungee with the Nitto. Fits nicely on the rack, but can be removed if you want to keep things minimal. The Nitto rack, like the Brompton rack, does not increase the folded package dimensions so packing the bike away in your B & W hard case, or your Brompton B-Bag will not be hindered by adding the rack. If you're wondering why the caster wheels are offset to the drive side (this is true of the Nitto Rack and the Brompton Rack) it's because the FOLDED Brompton is weighted to the drive side. The off-set wheels provide additional stability to the folded Brompton. While a hand-made rack from Japan is not an inexpensive option, Nitto has proven itself a very good value in the market of premium bicycle racks. The versatility and high-quality construction make this rack a sure recommendation at Perennial Cycle.